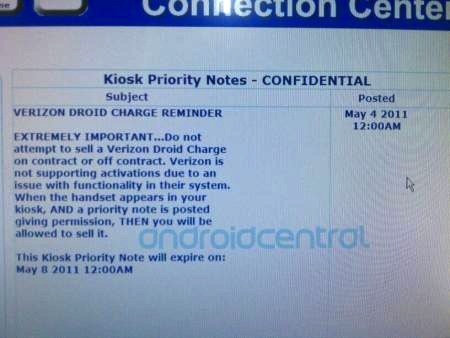 Walmart has sent out an EXTREMELY IMPORTANT note to its employees informing them to not attempt to sell a Verizon Droid Charge. While we are aware of suspension of sales, it seems that surprisingly some Walmart employees are not. The company is citing a “issue with functionality in their (Verizon) system” as the source for the delay. We has previously speculated that the delay came from the 4G outage last week, but it seems as if that is not the case. Walmart instructs its employees that the handset can only be sold when it appears in their kiosk AND a priority note is posted giving permission. We speculate that the author of that note was previously an elementary school teacher.